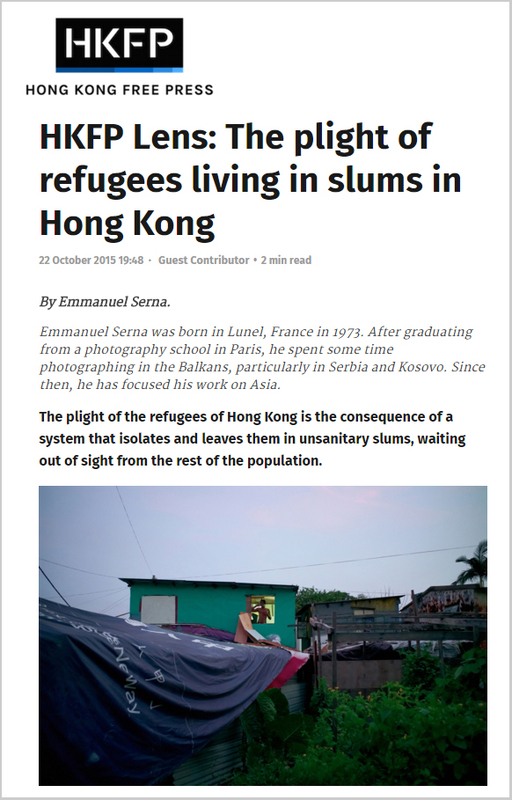 As an African refugee three years in Hong Kong, I appreciate the intertwining reasons why refugees escape to what they consider “safe havens” in developed countries. They are compelled to throw caution to the wind and embarked on life’s most dangerous journey. 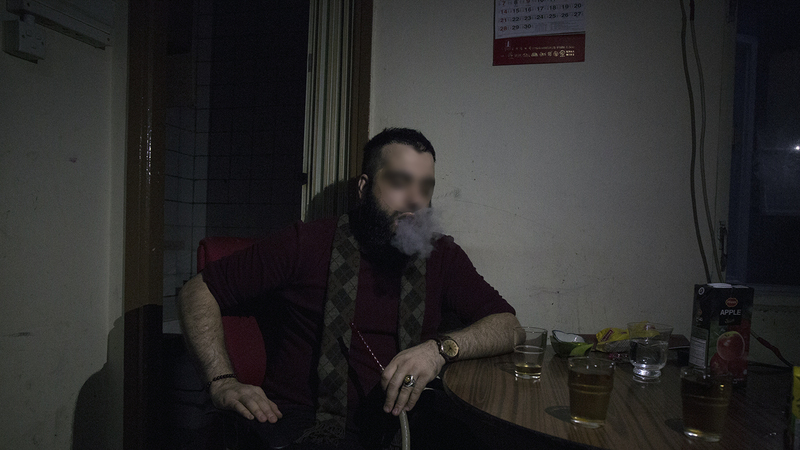 According to media reports, they pay large sums to smugglers who have turned their misfortune into an opportunity to earn millions of USD across different channels. Let’s not forget that refugees are not assured of reaching the Promised Land (Europe) and over 3000 lost their lives in the Mediterranean Sea this year. For spectators sitting in comfort, it may seem like an exaggeration. 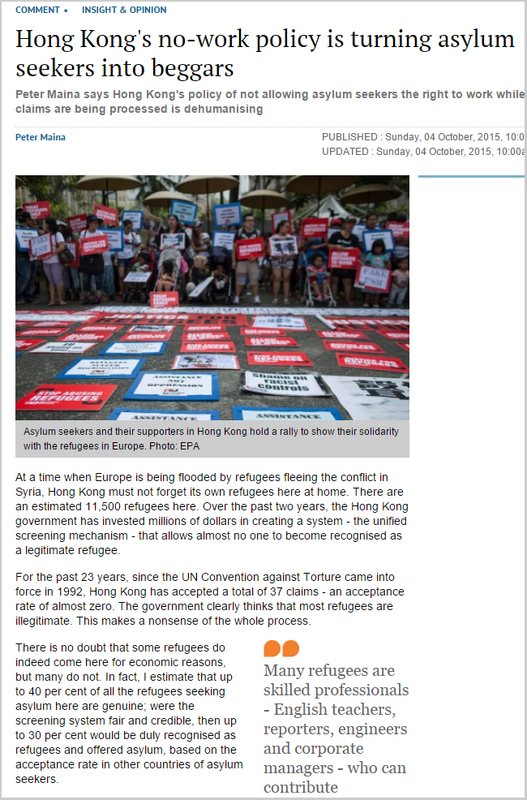 I have heard many comments being thrown around in Hong Kong about desperate migrants and refugees. Most critics and haters will never understand the HELL refugees suffer in their native countries. And this happens for a variety of reasons. 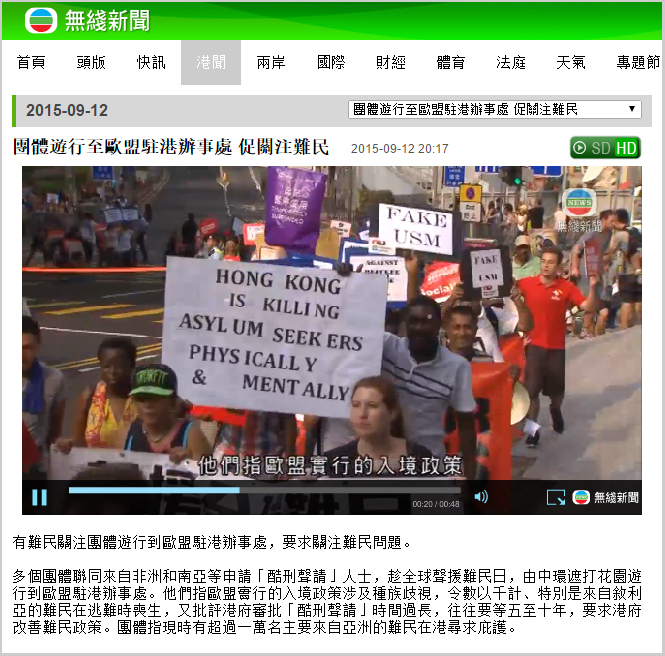 First, the government propaganda doesn’t make it easier for Hongkongers to appreciate the underlying issues motivating escape and the right to claim asylum. The government discourse disseminates biased, and sometimes ridiculous, information with a view to marginalize, dehumanize and criminalize refugees who exercise a fundamental human right. Second, the local media does not cast us in good light. We are called parasites, criminals, economic migrants and abusers of asylum. 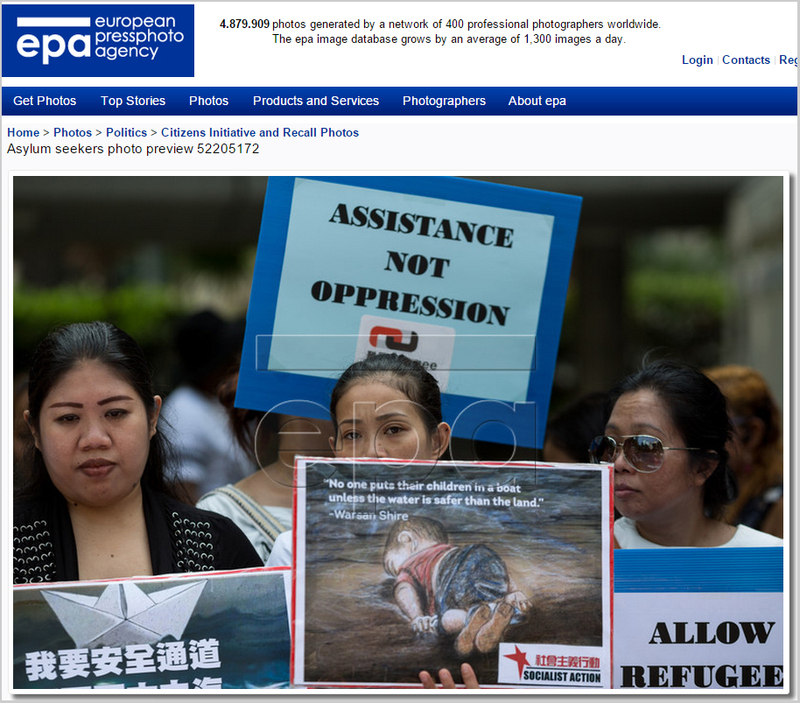 It is no wonder that the acceptance rate for refugees in Hong Kong is 0.3%. 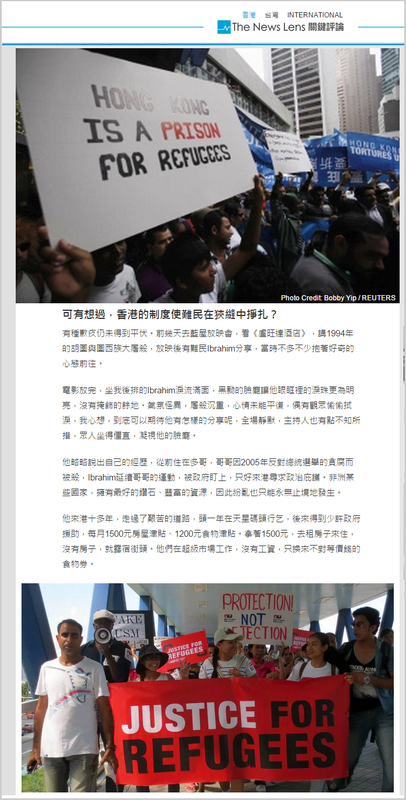 Despite 1.5 million once being refugees, Hongkongers today (conveniently) believe that none of the current 10,000 asylum seekers deserve protection. How ironic! Third, the status determination process is shrouded in such secrecy that refugees understand little about it. The onset of USM was welcomed with much skepticism by professionals in the asylum field. This is because the previous systems failed miserably in granting protection. 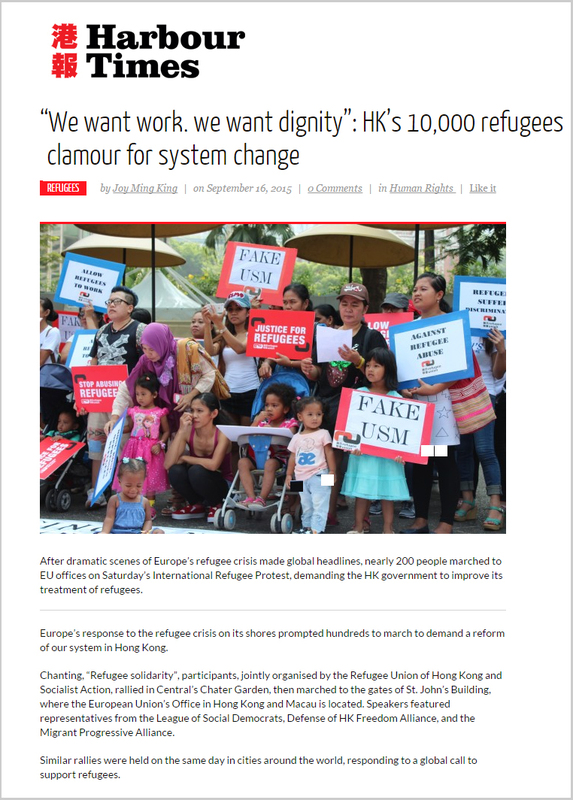 One year on, the USM has a dubious reputation as a process that hoodwinks refugees and those believing Hong Kong offers fair screening. How hypocritical! Though refugees crossing the dangerous waters of the Mediterranean are in great risk of losing their lives, nevertheless they are more likely to be protected if they make it to Europe. It is very unfortunate that this crisis is happening. Its occurrence is however hardly surprising. In this, Hong Kong insensitive response to the Syrian crisis is not ambiguous. When the Western countries invaded and destabilized North Africa, under the guise of fighting terrorism through NATO, they destroyed structures that held diverse communities together. For example, Western powers armed militias to overthrow the former Libyan strongman Murmur Gaddafi. They provided arms, logistical support and technical advice until Gaddafi was terminated. I believe this happened because Gaddafi did not play ball with, nor bow to Western influence in Africa. Instead he vigorously opposed neo-colonial policies and the modern globalisation that ensure that Western conglomerates continued to exploit African resources with minimal benefits for local populations. He was a great advocate of the United States of Africa. So am I. Before Gaddafi was killed he was involved in major campaigns across the African continent to bring all the countries and people together. He also offered scholarships to tens of thousands of students, yearly. But his efforts and influence were not received well by Western powers. He was perceived as a big threat to their grasp on natural resources and corrupt leaders. 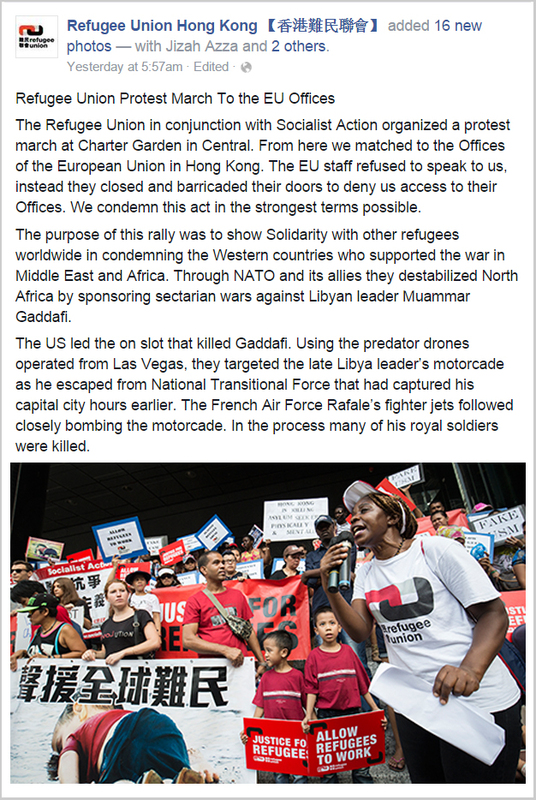 With Gaddafi out of the way, the 400 year pillage of Africa by Western states continues … and refugees flow north. As for Syria, the US should take all Syrian refugees home. The US wanted a regime change in Syria through undemocratic means. The world can clearly see the consequences of western military power. They invaded Iraq on the pretext that the country held Weapons of Mass Destruction and Iraq is today a shadow of its former self. Then the warmongers moved to Syria to topple the Assad regime. The suffering, destruction and death brought to innocent people is unimaginable. It is high time that Western powers take responsibilities for their actions. It is convenient that the US is far removed from Libya, Syria and Iraq, otherwise the States would be the ideal destination for all displaced refugees. Some commentators are rightly blaming the West for destabilizing the region and creating the refugee crisis.